This studio with balconny is located just a few steps from the famous rue Mouffetard in the heart of the Latin Quarter. Second floor via stairs in a charming small building. 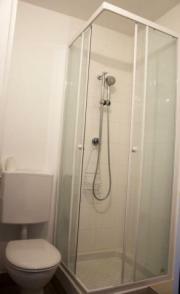 Fully refurbished with sofabed, open fully equipped kitchen, bathroom with shower, dressing and an office area. Several windows facing the quiet courtyard and a small balconny. Internet connection & cable TV. A well equipped spacious studio in a very nice neigbourghhood. 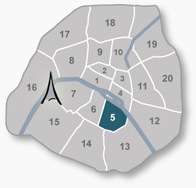 The apartment is located a few steps from the famous rue de Mouffetard on the Left Bank. Authentique food & wine stores, open fruit & vegetable shops and a lot of nice restaurants, caf�s and bistros in this charming area of Paris. Close to Sorbonne University, Jardin des Plantes and Place du Pantheon. A short walk will bring you down to the Latin Quarters in St Michel and the elegant boutiques of St Germain des Pr�s. Rue du Pot du Fer is a quiet pedestrian street. Living room with sofabed, book cases, a office area with desk and internet connection & cable TV. One window and one glas door giving acces to the small balconny. One large wardrobe. Wooden floor. 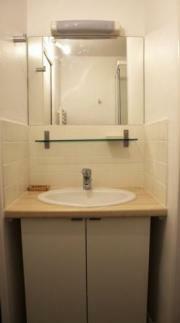 Bathroom with shower, sink, closet et WC. Small balconny overlooking the courtyard. The apartment is located a few steps from the famous rue Mouffetard. We rented the studio apartment at Rue du Pot de Fer for our daughter�s accommodation whilst she attended a semester at Sorbonne University, which is in very close walking proximity. The apartment had good security, and was located in one of the most safe and beautiful parts of Paris. Restaurants, shops, cafes, and the Metro Place Monge all within a very short distance. The studio apartment had all the necessary modern features, good heating and appliances. I would recommend this studio apartment to anyone else who requires a safe, convenient and lovely location for a stay in Paris. We would also like to thank �apartofparis� staff for their very helpful assistance and service before, during and after the rental of the studio apartment.